Twin Flame ( Divine lovers) Weekly Reading 24th-30th October; Back down to reality, Karmic bonds, The loss of love & the love of loss. Main theme ( Five of cups), What is occurring for both divine lovers (Ten of wands), Masculine – The lovers, King of swords, The chariot, Feminine – Four of pentacles, Four of cups, Justice. Extra card – The empress – The empress is the birthing, and the creation of a new self this week, as divine counterparts have successfully completed one of their many missions. The alchemical process of exchanging energies. 24th (6) – Childhood, past life, maternal care, parental care, abandonment consciousness – 30th (3) Magnified – Creation, manifestation, creativity, unity between the masculine, the feminine, and the shadow. The 5 of cups represents emotional loss, disappointment, and mourning over recent events. Perhaps there was a recent break up, or a sudden break down in communication. We may be feeling cheated because of a situation that has not worked out the way we thought that it would, or this may pertain to some dishonesty – potentially the third party situation described in previous readings, (as the five of cups represents mourning over three spilled cups). We may be focusing heavily this week on the past, and resisting the changes that have presented themselves to us. Perhaps we became too attached to the idea of something supporting our emotional well being, only to realise that we have been neglecting our priorities, and emotional responsibilities to self. The five of cups may also represent shame, as the individual appears to hang their head low over the scattered situation. For this reason, forgiveness is a big theme for both divine lovers this week. Forgiveness of themselves, and forgiveness of their union counterpart. The ten of wands describes a situation that became too much to handle. This is a defining point in our lives where we draw the line, and declare that enough, is enough. As the number 10 is symbolic of endings, transitions, and new beginnings, this could represent the month of October in which we have come to the realisation that we need leave certain behaviours, influences, and things behind. This may be in relation to the sacred union – in which one party felt that they were carrying all of the strain, and called time, or space on the situation. The ten of wands also represents letting go of internal baggage, and releasing our addictions to victimisation, or martyrdom. The ten of wands is about no longer being able to carry on in the direction that you were going, doing the things that you were doing. We have to drop some of the burden that we have been holding on to, and some of the ways that we have adopted, if we are to develop peace of mind, and truly gain access to a new beginning. It is not simply enough to beckon, or attempt to attract a new beginning – rather, it requires, and consists of participation, and some effort on your part. Change your internal, and your external will reflect who you are, what you allow, and what you experience. The feminine here may be shining the light for both divine partners to experience a karmic overhaul. Perhaps this is a wake up call for the masculine, as he recognises that there actually has been some loss here, and it is time for a change on a profound level. The number 10 stops us dead in our tracks, and we are forced to examine the extremes in our life. Nothing should be done to excess, but when we have no balance, we do not know the difference between enough, and too much. A more honest way of living is introduced here, as we recognise that this is one of the healthiest ways to live. Health is a major concern to us this week also, perhaps we are just over coming illness, or there have been health scares concerning our previous ways of living. It is true that it is time for change on many spectrums, and the way that we treat ourselves is under intense scrutiny. The five of cups is also a card of change. As things change, and seasons fade, it is often common to dwell on the past, what might have been, and what could be. Winter represents a period of this type of darkness, where we are to be still, and accept the next stage of our lives as it confronts us. Putting up a fight is futile.. Change, like death, is inevitable. Detachment is the practice this week. Finding balance between the things that we love, and the things that we can do.. Being a hero for your heart means sometimes, placing your mind above your emotional chaos. Unconditional love is the highest form of love to practice, and this goes with unconditional love for yourself. This is forgiving the self, and understanding the necessary growing pains that must occur in order for us to move on with our lives, and adapt to the demands for a purer way of being. All souls who are on the path of awareness must always face such monumental moments. The lovers on the side of the masculine speaks of his thoughts this week residing with this spiritual union of his. Perhaps he cannot shake the weight of guilt on his part. If there was a loss in this union, and the feminine tore herself away from him, then he is definitely dealing with the repercussions of her actions – although, somehow, a part of him admires the part of her that was finally able to be honest with him. He did not need the martyred version of you at that moment. It was a hero in love he sought. The recognition of what has taken place here, and how he has played a part in it, is causing a stir in his spiritual awakenings, and foundations. The ego version of himself is being pulled into question. How much the ego can cancel out love. And how so often we allow it to.. The king of swords takes us into his reluctance to allow himself to be an emotional mess this week. He is still very much holding onto the part of him that wishes to experience his emotions through rational thought, and not through burdening himself with uncomfortable feelings. This is his resistance still to allowing himself to go too deeply, and too dark into the abyss. Yes, he is still dealing with his version of spiritual ‘karma’, but he is attempting to search for solutions, and using this as an opportunity to clear his mind. This means alienating the space that exists for his shadow self to operate, and focusing on getting the things done that must be done. The feminine on the other side, appears with the four of pentacles. This suggests that instead of allowing herself to become entirely engilfed in the hardships of this period, she is attempting to turn her focus towards financial gain, and preserving her business ideas. Nurturing her career, is one of the ways in which she will practice self love this week – as this is a direct investment in herself, and her growth. She is not using work so much as an escape, but rather a reason to keep going, and to break out of the self imposed victimhood that she engaged in not long before. The number four appearing twice for her;again with the four of cups is suggestive of the idea that the feminine seeks order, structure, and strong foundations at this point in her life. It is the only way that security of some sort can be grounded, if she first establishes this for herself. The four of cups represents many moments this week where she may find herself dwelling negatively on the situation, escaping into day dream over what occurred, and failing to see the positives in the situation that is before her. Perhaps she is beating herself up about what she did wrong, and right, and how all of the events transpired. She may still find herself too caught up in 4D this week – the realm of over thinking, and over imagination, so, it is important to remember the four of pentacles for balance when this occurs. It is okay to find epiphanies through allowing your mind to wander about this romantic situation, but still, there are things that must be done, and things that must be built. There is definitely a new beginning being presented to her by the fourth cup extended in the traditional four of cups taro – however, the feminine will not be able to see this if she keeps getting lost in the details of what happened. There is a bigger picture at play here – even whilst it cannot be seen. The chariot suggests an eagerness, and a willingness on the masculine to make a move. But what will this move be? I want to challenge my followers to something a little different this week.. As we are practicing the theme of detachment, I have decided to allow you all to discover your OWN individual outcomes for this week.. Alot of the ways in which we create attachment, and subsequently disappointment in situations, is because we attempt to weave ourselves around one specified outcome, and fall apart if this does not become our truth. The truth is – there are several truths. Some divine masculine counterparts this week, will use the force of the chariot to continue pushing forward, and trying to keep the feminine by their side. The others? Will use the energy of the chariot to finally turn away – change direction, and embark on a new story…Sometimes, the heroine lies with the one who chooses to walk away, especially when too much damage has been done. The justice card is the feminines final call for karmic balance. She says, ‘I did not even want to leave you’ ‘I did not even want to fall out of love with you’. ‘ I JUST want balance in my life! This is all about having ENOUGH, and not living on scarcity, internally, or externally. There has to be some sort of ebb, and flow, or life is completely out of wack, and this is a lesson that both divine lovers are learning this week. And the feminine, either directly, or indirectly, has triggered this state of awareness, and recognition within the divine masculine. 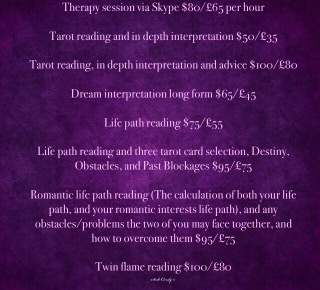 Posted on October 27, 2016 Categories (Para)psychology, Esoteric Knowledge, Karmic Lines, love, metaphysics, Services, spirituality, Twin FlamesTags heartbreak, loss, love, relationships, tarotLeave a comment on Twin Flame ( Divine lovers) Weekly Reading 24th-30th October; Back down to reality, Karmic bonds, The loss of love & the love of loss. Twin Flame weekly reading – 29th August-4th September; The balancing; of romance, and earthly duty. Main theme – Ace of swords, what is occurring for both twins – King of pentacles, Masculine – two of pentacles, queen of cups, the world, Feminine – six of wands, the lovers, ten of cups. Numerological breakdown – 29th (11 day) revelations, spiritual realisations, and lessons – 4th (organisation, hard work, structure, and stability. The main theme being the ace of swords shows that both twins this week, are experiencing a mental break through, a process of mental clarity, the likes of which have not been seen in a long while. This is a 360 transition of the psyche. A shift in perception, and perspective thinking. Things are revealed to them through internal knowing, without much conscious effort – this could be the work of a spirit guide, or strong intuitive ability growth. They are bursting with ideas this week. This is, ideas about ways to build new finance, and generate income also, as shown by the King of pentacles, which was also present in the general weekly reading. Progress within their respective fields, and dedication toward work, and growth shows just why these divine lovers, were hand picked by the divine to go out there and do the work that they are doing, to spread the message, to care for the masses. They are both responsible and this week, they are only growing in responsibility as they recognise the weight of their mission, and why they must keep going with it. This means breaking free from poverty consciousness, and dispelling myths about timidity or limitations. These divine lovers are destined to do work that expands world wide, they have these huge destinies, and their consciousness this week is echoing, ‘I want more for myself, because I want more for others’. Realisations, epiphanies, revelations will arrive to them this week, ‘THIS is what it was all about all along. Me. Me and my purpose’. The feminine this week, is breaking free and breaking out of co dependency, whilst the masculine, is recognising that it is okay to mean on somebody, and to be a little emotionally vulnerable, and emotionally open. This is where the two of pentacles comes in, balancing his work life/duty, with, his queen of cups, he thinks to himself, ‘If and when I have enough, when there is no lack, I can provide more resources, not only for myself, but for others. And this is my purpose, and this is my place’. He is stepping into his role this week, of the provider, and the protector, and the care giver. Balancing his finances with his earthly duties, and his responsibilities is very important to him this week, and it is equally important for him NOT to feel like the entire world is on his shoulders. He may need the emotional support, and reassurance from the feminine, and with the lovers card on her side, it seems as if she is willing on some level to provide this, even though her focuses are currently on building her own empire. He is opening up emotionally bevause of how open and vulnerable the feminine has been with him. He sees her as this delicate creature, emotional, sensitive, nurturing, and maternal – the archetype of the wife, and the daughter (simultaneously). 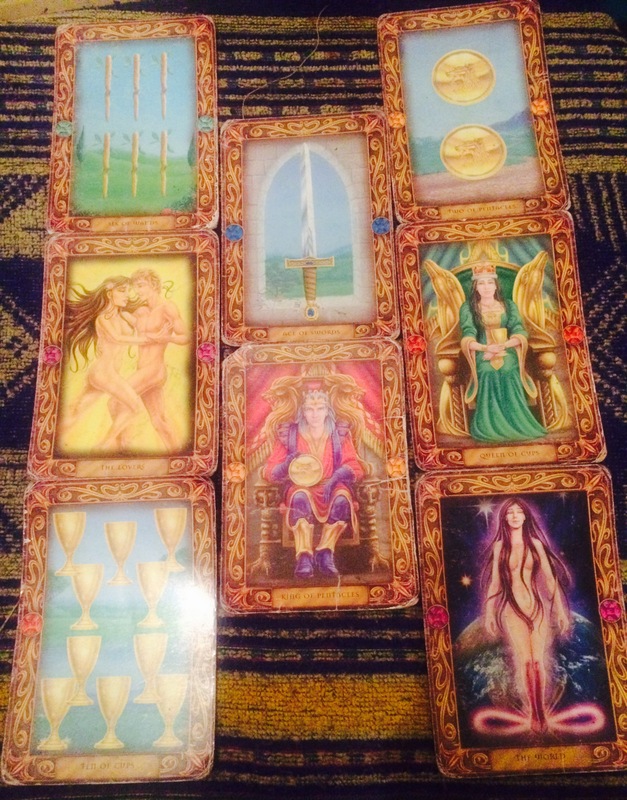 This is a huge shift in consciousness, because the feminine instead of being just focused on him, and love, and relationships, as she once was, now, she is focused on her own victories, with the six of wands, she is looking toward financial gains, Recognition within her field, and getting what she deserves, by learning the vital lesson, that it is indeed what she deserves. She is falling in love with her work, and her purpose again. Romantic Love is important, and will always play a major role within her life, but, she is realising, that if she wants healthy love, non attachment love, then she needs to have her ‘own’. And this is not the only type of love.. Her own energetic pool of resources, a love outside of love, a thriving career, a steady life, good friends, emotional equilibrium. She needs to be balanced before everything can come together full circle – as with theten of cups. Emotional fulfilment is at her door, knocking, she can have it if she wants. She is worthy of love, she is love. And if there was ever a doubt about this within her mind, this week will dispel this myth. The way that the masculine views the feminine is changing. In the world card, it appears as if the feminine figure is almost giving birth to the earth, and to a new world. This is the gratitude in him for what the feminine represents – conjuring, birthing, maternal, eternal love. This is placing an end to separation consciousness, within, and without him. Inspiring him Not to abuse his power, because this is a sensitive, beautiful, and vulnerable soul – much like he himself is. Posted on September 1, 2016 Categories empaths, Esoteric Knowledge, Karmic Lines, love, metaphysics, Services, spirituality, Twin FlamesTags divination, empath, empaths, esoteric, healer, healing, intuition, intuitive, love, metaphysics, mystic, soulmates, spiritual, spirituality, tarotreader, tarotreading, twinflames, writer, writingLeave a comment on Twin Flame weekly reading – 29th August-4th September; The balancing; of romance, and earthly duty. Full Moon in Aquarius – Expansion, Karmic relations (attachments), finales, and letting go of the ‘little self’. It is no secret that for the past few months, (weeks especially), we have been enduring a mass, intense cleansing process, in which many of our shadow traits, and fears have been brought up to the surface. Those of us who have been caught up in a fallacy of healing, (knowing what to do to heal, but not actually digging deep enough to heal, or to know what to heal), have been hit with massive realisations, as we have been urged more, and more to confront the truthful intricacies of our wounds, and dilemmas. This has not been a time for the faint hearted, and I believe that empaths, and highly sensitives in particular have been targets, as we are homes for tremendous amounts of karmic residue, ancestral wounding, and woundings belonging to the entire collective template, specifically embodying masculine, and feminine akashic wounds, dependent upon our gender, or dominant energetic gender resonance, (masculine, or feminine energies). And what an absolutely FANTASTIC full moon to be gifted with at this time, after our new moon in Leo, only a few weeks back. And I can tell you, the theme of expansion, being target driven, and living, and thinking big, is most certainly continued here, with our sign of intellectual goals, big dreams, and non-conventional thinking. There is no room for the little self, the victim complex, or small thinking where the energy of Aquarius is concerned. This sign deals with service – service to humanity, and wider thoughts on a grand scale. This is a time where we ask ourselves, have i been too humble, and passive about the gifts that i posses? How can i be sure that i am applying myself to the best of my ability, and reaching as many people as possible? A calling song for the empaths, light workers, artists, creatives, and hyper sensitives who so cleverly fuse their past experiences, wounding, healing, and teachings into fruitful means for the consumption of others. This is largely all that the Aquarian seeks to accomplish – to use their big ideas, intuition, and ability to see through the strains, and the toxicities of society, and culture, to be of service – in a big way. Much like God’s right hand man, this is the energy that propels us into a place of service, and purpose. There is no way that you can STILL think at this point that you are unworthy, abandoned, unloved, or placed here for anything other than a higher purpose – so all of these old, and karmic stories you have been telling yourself, must die here, must die now, along with your old self. Accessing a broader goal, means seeing yourself in a new light. It is true that you cannot hope to play small, or to think small of yourself, if indeed you are to achieve largely. You have to believe in yourself in order to make any dreams come true, and it is time to see your past experiences for eactly what they were – lessons, vital lessons, and directions from the most high, about how to live your life, about what needs healing, about how to heal others. Nobody said that messages would be brought to you via hawk, wrapped up in golden lined paper, and sealed with a pretty little golden bow. Nope – the most high has this almost sadistic way of gifting lessons to us through painful encounters, particularly using our family lineage, and relationships, once we get old enough to experience them. Hey, I guess source knew that this was the only way to ensure that the message was not missed – nor neglected. Part of our evolution in this time, is using our collective lessons to be of service in some way, to point out the truths in the pains, that many of the rest of society, and the world fail to see, because they have not allowed themselves to be sensitive enough to feel so deeply, to perceive so deeply, to collect so much data, and frequency. It is time that we must realise, our lives are not only for us, and in this way, we can never be alone, neglected, or in the wrong place, at the wrong time. Our lives belong to those whom we inspire, and those whom inspire us, no matter how this inspiration threads, and weaves itself. For me? I discuss narcissists alot, to quite an intricate degree, and I cannot help but thank my ex lovers, for providing me with such a heavy, and hearty body of work, and pool of knowledge. This is my growth, this is my ability to work in moderation, to take the good, with the bad, and to be grateful for the accessing of such karmic recognition. It is only in recognising our karma, that we are able to clear it. Had i not identified a pattern of being attracted to narcissists, and narcissistic abuse, i would not have recognised that something in me dances in unison to their song, that something in my family, harmonises, with this very script. The numerological placement of this full moon alone speaks volumes of its purpose within our lives. The number 18, is a culmination of new beginnings, (1), and karmic cycles, (8), inevitably bringing us to the number 9 (1+8), which is the number of resolve, conclusion, endings, rounding things up, preparing for death/rebirth, and using the lessons that we have learnt to grow stronger, to communicate, to create. The world, strength, the lovers, five of swords, six of pentacles. The world card sees us definitely exploring themes of expansion here, believing in divine timing, and divine guidance, being at the right place, at the right time, and all of our life events and experiences being in sync to offer us the best possible chances of being perfectly suited for our roles, ambitions, and purpose. This is all about understanding that there are no coincidences, we are tied to a certain string, a certain rhytyhm, and in appreciating this, we can effectively clear our karma by showing gratitude towards the things that have hurt us in the past. For they too, were necessary. Looking back is futile at this point, particularly when we have such a grand destiny ahead of us, unfolding for us, by the second. Thinking small is a thing of the past, associated with our ancestors who could only achieve so much, only do so much, and lived in fear for the most part. This karma, is not ours to keep. Merely ours to acknowledge, appreciate, and transmute. The age of Aquarius represents a new dawn, and so shall the full moon in Aquarius. The lovers card in culmination with the strength card speaks our our ancestral karma that manifests within our relationships. It is true that our relationships are direct reflections of the patterns that we inherited from our family, ancestral lines, and most specifically parents. If we had somewhat shaky foundations, as many empaths, and light workers do, then this set us up for many dysfunctional romantic relationships later down the line. The weight of these relationships no doubt cemented the thoughts that many of us already held, that we were somehow damaged, destined to live out a life of abandonment, or unworthy in some ways. However, this is our grand opportunity, to realise, along with the world card, how even these experiences were most fated, useful, and purposeful. The five of swords represents an ending to this inner, and outer conflict, with the six of pentacles urging us to write a new script, for ourselves, and our relationships. This is representative of fairness. Knowing that fairness is truly what you deserve, that fairness exists within love, and opening ourselves up to receive it, by no longer displaying the themes of lack consciousness, and scarcity as depicted by the five of swords. The strength card is the conquering of our little self, our ego self, the beast within that constantly seeks harmful, and harsh relationships through our negative self talk. The world card is all about our responsibility to serve, realising that our past experiences are in fact bigger than us even, and expansion is the goal of such painful endings, not shrinking, not quelling, and not re-enforcing out dated mental, and internal stereotypes.. Welcome a new version of yourself, a version so prone to healing, and positive experience, that you are almost unrecognisable..Keep the faith. Monitor your self talk, slowly re-wire the expectations and connections of the mind. © Seek Cindy 2016. All works published on this site are property of the owner, and should not be copy, paraphrased, or re-distributed without permission, and necessary credits. Posted on August 18, 2016 Categories (Para)psychology, astrology, empaths, Esoteric Knowledge, Karmic Lines, love, numerology, spirituality, Twin FlamesTags astrology, astronomy, divination, empath, empaths, esoteric, forecast, healer, healing, intuition, intuitive, lightworker, love, metaphysics, mystic, numerology, predictions, soulmates, spiritual, spirituality, tarotcards, tarotreader, tarotreading, twinflamelove, twinflames, twinflameunion, writer, writingLeave a comment on Full Moon in Aquarius – Expansion, Karmic relations (attachments), finales, and letting go of the ‘little self’.